I guess Masseter is available in radial as well now. I have an AS200 which is running MRF Revz-S 130/70-R17 rear and MRF Zapper FY 110/70-17 front for almost 10k Kms. Since ive ridden mostly hills and a lot of bad roads the tyres have lots of small cuts. The grooves are still deep and the tread wear indicators still indicate more than half life left. pics attached. First 2 are front tyre, last two are rear tyre. I dont do speeding corners. Mostly ride under 100kmph, sometimes cross it on highways. DO a lot of bad roads. 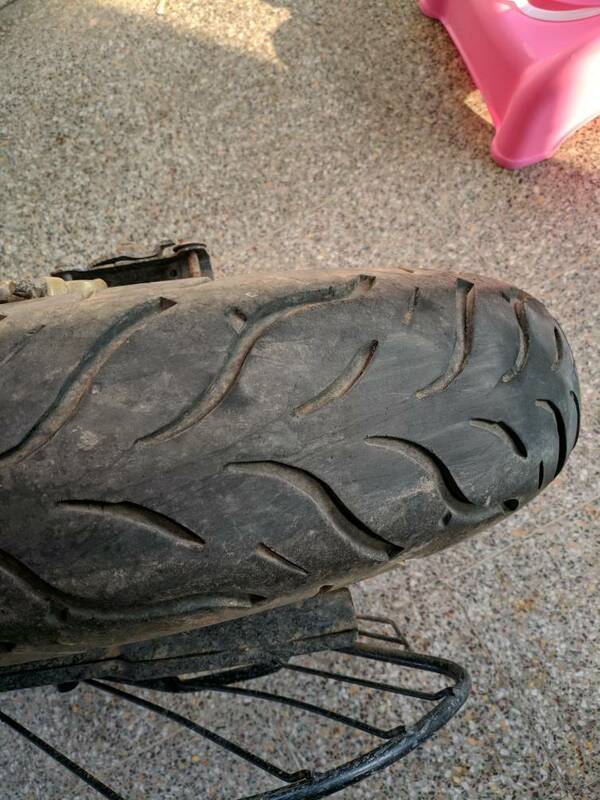 Are these tyres good for use or do i need to change them? The massetter is available in 140/70-17. Will this bigger tyre fit the AS200? I was thinking of this too but there is not much spapce between the tyre and the swingarm/tyre hugger. Anyone has fit 140/70-17 or 150/60-17 tyres on AS200? Last edited by guptavis; 11-07-2018 at 09:14 PM. I've got Massater 140, My friends got PSR 150. No mods are required. I've got an AS200. I know this because I contacted mrf with the same doubt. Msx is bias ply. MCT is multi compound. MCT have, would be better. Yup. I contacted MRF as well and got the smae answer. I've got the Massater MCT. As per the website there's no front tyre. But they do have a Massater in 100/80 for the front. I am using Masseter for last 18k Kms, and need to change it soon. I never had Michelin on my motorcycle, but as far as i heard, Masseter has better overall performance as Michelin is notorious on muds and wets. BTW did anyone notice that the thread title has a type error? Shashank K R likes this. After ~20k kms does the sidewall get any cracks like the RevZ series? Hi, I have recently changed my CBR 250 tyres from MRF Revz to Masseter. Has anyone felt a little tightness in the handling after changing the tyres. Is it normal? or I need to check with the alignment of the tyres. I have recently changed the fork oil seals, cone set and front bearing. Let me know your thoughts and experience. Thanks! By gurudevan in forum xBhp Classifieds: Buy, sell, rent, or give away! A super sport or a Naked Sport ? By carelessakki in forum What Bike? By Devraj in forum Do it Yourself!